Niasia Williams is incredibly passionate about STEM, specifically within the Black community. Perhaps that is no surprise if you know the 24-year-old’s resume. Currently, Williams is the National Chair of the National Society of Black Engineers (NSBE), the largest student-governed organization for Black students and professionals in STEM. She’s a practicing engineer at Pratt and Whitney, an aerospace manufacturer in East Hartford, Conn. But, for Williams, STEM is more than just working in the fields of science, technology, engineering or math. Most important for her is STEM education—or, as she puts it, STEM literacy. “The next economy is going to be based off of technology. We know that. We see more jobs are opening up, and we see it in the globalization of our economy and many other countries. And, again, that’s all driven by technology,” Williams explained to ESSENCE. “The only way that I see for our community again to raise itself up—and then be able to participate and compete—would be at least to be STEM literate,” she added. “I met a lot of children, young ladies, who are very interested in makeup and they want to have their own makeup line. And what I tell them is that especially anything with the Arts or creativeness…you at least need to know the business aspect of it, because you’re trying to run your own business, but then also you need to know how your products are made. So that one, either you can make it yourself; or two, if somebody is quoting you and saying, ‘This is how much it’s going to take, and this is what should go in it,’ you’ll be able to say yes and no because you’re educated on the materials and how things mix together,” she pointed out. “There’s so much value in STEM literacy across multiple career paths. And, again, without that, the Black community and other minority communities, quite frankly, would be left behind. We really need those of us who do know better and who do have the access, we need to continue to pry the door open,” Williams added. And it does take a bit of prying. Williams remembers always being interested in science and problem-solving for all her life. Her stepfather, who unfortunately passed away when she was 10 years old, was a mechanic. Her mother, a certified chef, encouraged her exploration. Her stepfather, who once built a car, would take her on trips to pick up parts and other materials needed to refurbish the car. “Even that experience—where again it wasn’t something so girly, according to stereotypes—because I was interested and because I wanted to learn, I was allowed to do that,” Williams said. By the eighth grade, Williams knew she wanted to study mechanical engineering, something that she felt incorporated all of her interests in science, math, art, design, and also of course just helping people. But she was soon struck by the realization that her desire wasn’t always met with the open encouragement that her mother and stepfather displayed. “Going through middle school and high school having that kind of want and desire, it was very much an anomaly,” Williams told ESSENCE. “I didn’t actually get much support and for some people, I would say it was because of negative thoughts about me and my profile being young, African American, and a female child, that wasn’t necessarily the profile for an engineer, especially somebody in the mechanical field,” she said. There were also those people who simply didn’t know how to help, such as when Williams was prepping for college. “How do you apply? What type of programs do you go after? They really didn’t know. And I found that out in high school when I was applying to colleges, my counselor literally handed me an old school brochure book that listed all of the programs and all of the schools, and said, ‘Go through it like old school and figure out where you want to go.’ And that’s the help I got,” she added. As such, Williams has made it a point to push STEM education, not only in a personal capacity but as the chair of NSBE. Williams currently sits on the board of directors for STEM Education and Diversity & Inclusion at Achieve Hartford, a group of private sector leaders working to close the opportunity and achievement gap in Hartford and build a viable talent pipeline for the region. She is also involved with Access Education Services in Bridgeport, Conn., which provides STEM-focused academic enrichment and college prep resources to K-12 students. Williams also works with Girls for Technology, which provides STEM afterschool and weekend activities to underserved and underrepresented girls in the region. Williams got exposed to NSBE during her sophomore year at Rutgers, where she was a STEM scholar with NSF at the Camden campus. She remembers looking around her community and realizing that there was a lack of resources and a lack of people who were willing to teach or work with underserved young people, and so she started mentoring. 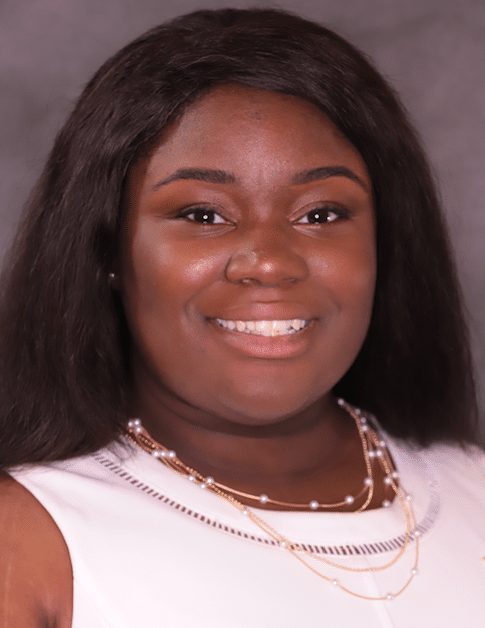 Her drive for community involvement prompted her to join Sigma Beta Sorority, and soon she dove head first into NSBE, working her way up from Technical Outreach and Community Health Chair to National Chair. “After I [became National Chair], what I really wanted to focus on was repositioning NSBE to be more of a solid placeholder in policy changes when it comes to STEM education, be more of the face of what professional engineering can look like within the United States and also across the globe. And then there are also some internal things such as making sure that each member was involved, not only in community work, but also in their own personal enrichment and development from our youth programs to the collegiate, to the professional,” she said. Williams is not only talking the talk, but she’s also making sure to walk the walk when it comes to STEM education. She is in the middle of finishing up a second masters in STEM education to ensure that she is well studied in what she’s trying to accomplish—which is first and foremost the education of others. Williams says that Black people across the career spectrum should be a part of the change we all need to see.